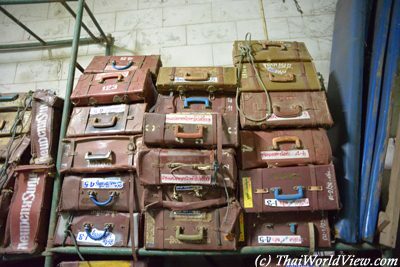 This page is about one kind of open-air cinema in Thailand i.e. "NANG KLANG PLAENG" (หนังกลางแปลง), which is shown in open-air during specific events (funeral, ordination...). There is no fee as a sponsor pays the whole bill. This open-air cinema company is a family business. 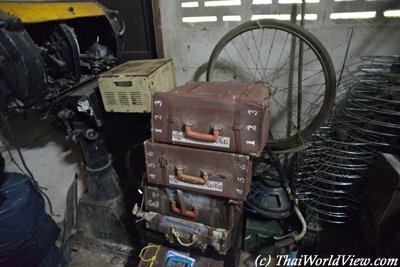 The owner is a lady called Phi Mon. The father was the company owner before but then his children have taken over. 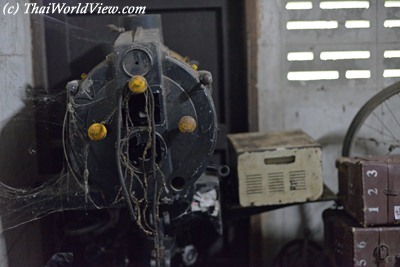 As the house was big enough, they could keep many movies and cinematographic equipments such as this projector. Open-air cinema business is going down those days and of course especially during rainy season. 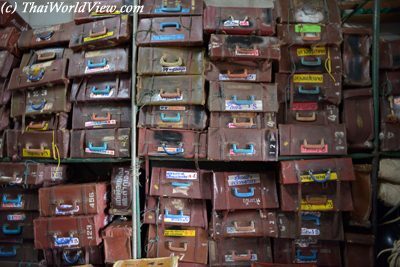 This open-air cinema company still has up to 200 movies so the walls are covered with reels boxes. This open-air cinema company still plays outdoor movies a few days a month. 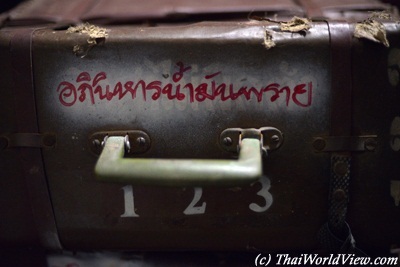 It has been opened more than twenty years ago. This company has difficulty to find business those days. New films are too expensive. Old films don't interest people so it is difficult situation to survive. There are two kinds of movie films, i.e. 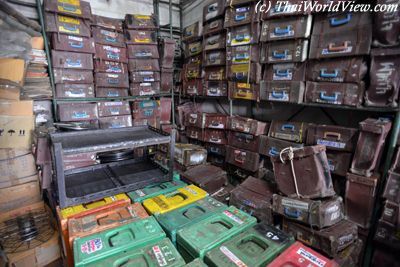 gold film, black film or ordinary film Gold films were introduced around year 1982. Gold films are stronger and supposed to last longer. Black or ordinary films were introduced before Gold films. After twenty years, the movies reels get altered and only the red color remains. When movies become red, they have no values for open-air cinema companies so often they throw them away but keep the metallic reel. 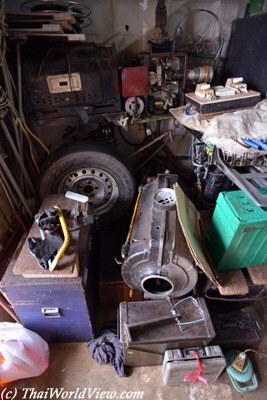 Another old projector is kept inside this old open-air cinema company. This is the poster for Thai movie เงินปากผี. 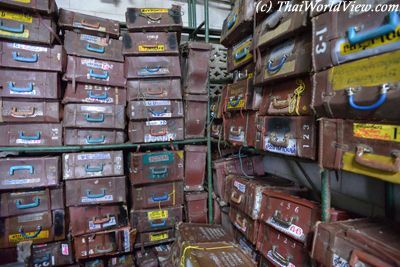 As Trat city is located near Cambodia, the movie has been renamed "Khmer Ghost". 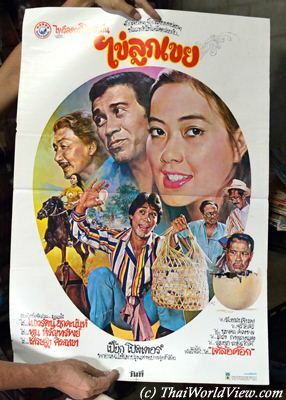 Old movies poster have also high resell value. 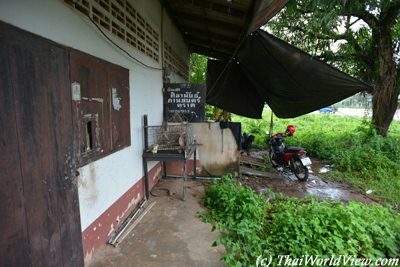 In year 2014 a robbery happened in Chatujak market in a shop selling old movies posters. Khun Taeng (แตง โปสเตอร์) lost all her posters. 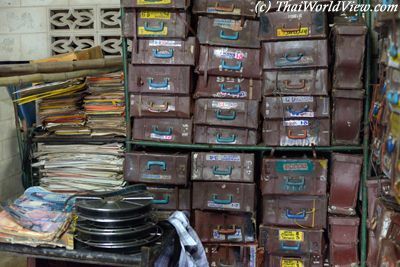 Leather boxes to keep movies reels are better than modern plastic boxes. Air circulates better so the movies reels can breathe. 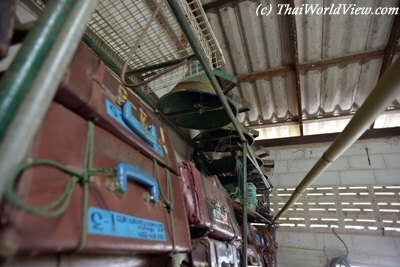 Plastic boxes are resistant to water but movies reels inside can "bake" due to Thai hot weather! 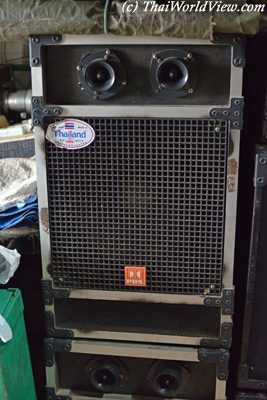 Old loud speakers are stored above the numerous movies storage boxes. 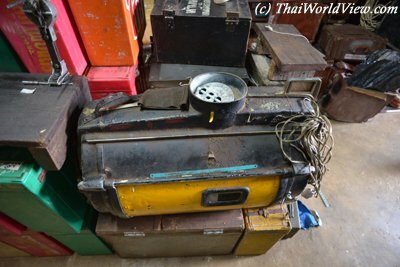 This open-air cinema company still owns many old movies such as อภินิหารน้ำมันพราย (1984). Such open-air cinema company has Chinese, Thai and foreign movies in order to please all audiences and the sponsor (เจ้าภาพ). 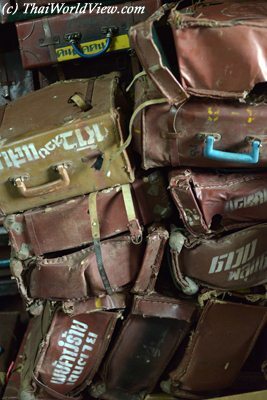 During the boom era of outdoor cinema, there was no TV in villages like nowadays. So sometimes the whole village was coming to watch the movie. It could be 500 people or up to a few thousands. Issue was happening during the raining season as movies couldn't be shown outdoor due to rain. 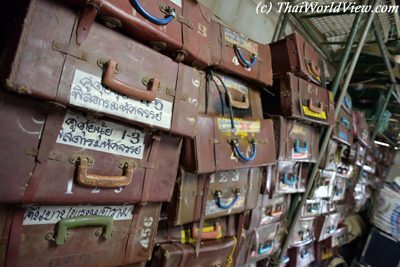 So some Buddhist temples allow to screen movies in the pavilion for ceremonies and sermons ("SALA" - ศาลา). This Open-air cinema company is a small family business involving two people. 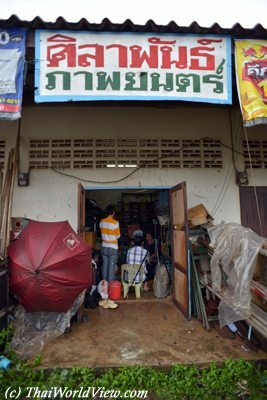 Their business is happening in an area 40 km maximum around Trat city. 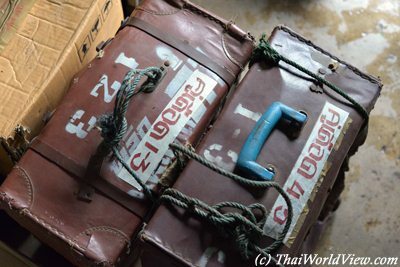 In the past, movies were sent from Bangkok to Thai provinces. Open-air cinema companies bought one popular movie and get one less popular movie for free as many movies were released in decades 1970s~1980s (80~100 movies a year). 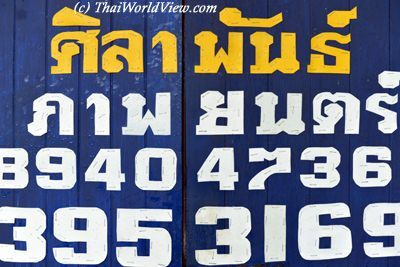 The fee for three movies is around 3500 baht in year 2014 in Thai provinces. 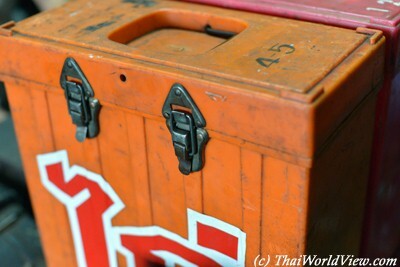 Nowadays most of the requests to project movies is for local fairs or rewards to spirits (แก้บน). Somebody may have requested something to a local deity. As it happened, he has to give a reward to the spirit such as an open-air cinema performance. Before such open-air cinema performances were also happening during ordination ceremony and cremation ceremony. 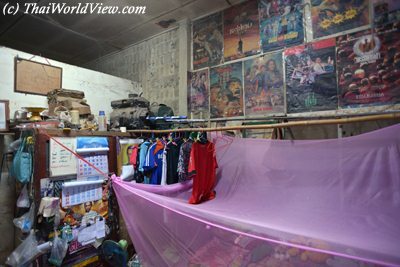 A seldom known form of open-air cinema is called "NANG KHANG KHLONG" (หนังข้างคลอง). It features a 7 meters screen. It is a movie projected on a big screen on a river bank. 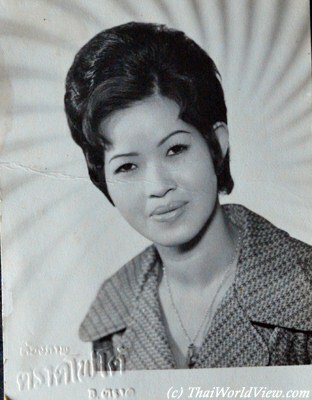 Beautiful old picture of Phi Mon's mother many years ago. 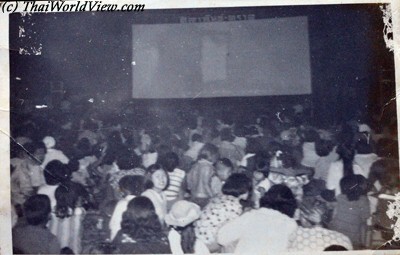 Nowadays less people watch Open-air cinema (หนังกลางแปลง) due to better convenience of watching DVD at home or on a computer.